My grandmother used to say, “You were the most nervous baby I’ve ever seen.” My grandmother (who was a ferocious and elegant 90-pound lady, like Lillian Hellman and Lauren Bacall had a baby and dressed it in tasteful separates and a hair helmet, and oh God, I miss her so much) looked concerned when she said this, which never failed to aggravate my mother. I have a lot of faith in Ma Smash’s opinion on everything, but her medical advice is always spookily sound. (“It’s appendicitis,” she told the doctors, long before she had her nursing license and just before my appendix ruptured. “It’s thyroid disease,” she pronounced firmly, thirty years later, when my hair was thinning and I couldn’t lose weight.) Here, though, I wonder if it matters all that much. As a baby, I was either nervous or undercooked. The same could be said for me now. I’m still trying to figure out what the hell is going on, out here in the cold. Anxious people and depressives are kindred spirits. Everyone secretly believes that if we’d just grow some stones, we could get over it. The truth, of course, is more complex: we can and we can’t, we want to and we don’t, we’re definitely biologically, physically ill, but on the other hand, it’s all in our heads. The doctors and therapists I like best don’t make a distinction: if I feel ill, then I’m ill.
For the most part, I prefer to endure my Victorian lady-nerves without the help of tonics. I feel very brave about this, even though I don’t think there’s anything wrong with better living through chemistry. I am, however, terrified of benzodiazepines. People who say they couldn’t get hooked on these are fooling themselves. Any time I’ve taken them for anything, about twenty minutes after swallowing the pill, I think, “Oh, that’s right: this is AWESOME.” And then I renew my pledge to a) not start taking benzos on a regular basis, and b) be kind to drug addicts, who obviously are the only people on earth with their priorities straight. 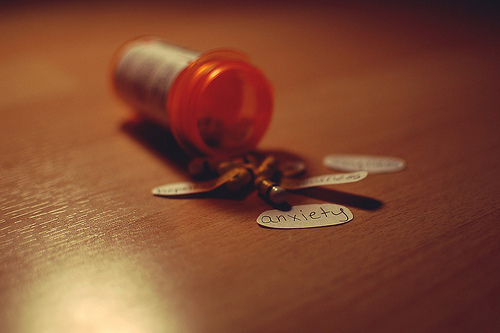 I’m so scared of getting hooked on something like this that the few times I’ve been prescribed anti-anxiety medication, I make my doctors promise they won’t give a million refills. And then, I presume, they start feeling around on the floor for the silent alarm. But they’re always both kind and firm, which I appreciate. All of this background information is important, because it’ll help you to visualize how odd I felt, when I found myself fighting over a prescription for one single Valium with my doctor. I have to go for an MRI next week, to make sure that my ever-present back situation isn’t secretly my spinal cord trying to break free and scale the alps on its own, presumably while singing and brandishing a walking staff. You see, I cannot get into an MRI without chemical assistance. It’s not that I don’t want to. The MRI machine and I are like ends of a magnet, or, if you like, a Looney Tunes character being stuffed into a shoe. It’s not going to work without me losing a lot of feathers and the hospital staff winding up with a lot of cross-hatched wear marks on their suddenly tattered lab coats. “I’ll give you two,” she said. Goddammit, I’m taking both. If you need me next Tuesday evening, good luck to you all. I’m sure I’ll be very happy to talk to you, but I won’t remember a word we say to each other. It is, however, a rare opportunity for anyone who wants to see me calm for a change. The reason these drugs are dangerous is because them shits is good. OMG – you are so funny. Hope the MRI went well.